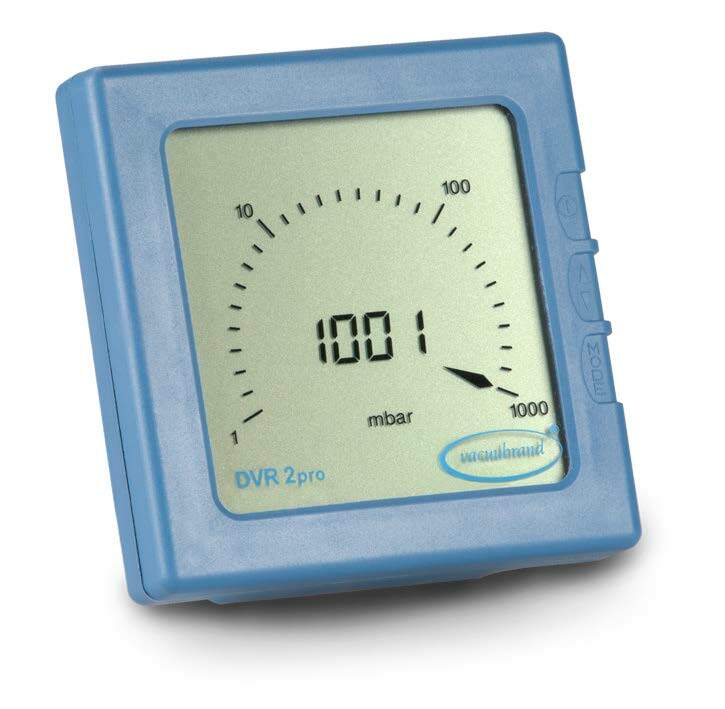 Product and ordering information for DVR2pro Vacuum Gauge. Fully electronic gauge with both digital and analog display. Ceramic diaphragm sensor for corrosion resistance. Battery-powered. 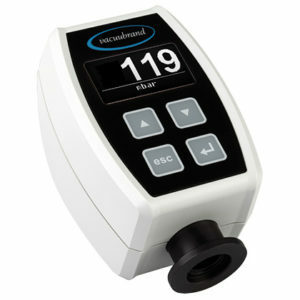 Measurement range 1-1080 mbar. NEW! The VACUUBRAND® DVR 2pro is a fully electronic absolute pressure vacuum gauge for measurements in the range from atmospheric pressure to 1mbar/Torr/hPa by means of an integrated capacitance pressure transducer. 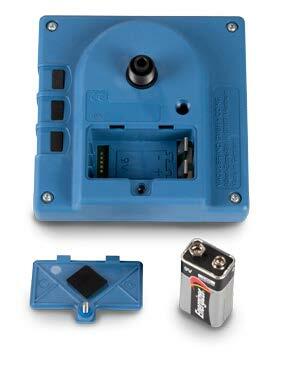 Powered by a 9V alkaline battery for portability, with an easy access door for quick replacement. Select from the three different included vacuum connections: a 6-10mm (1/4 – 3/8 inch) hose barb; a KF16 small flange; or a 10/8mm compression fitting. 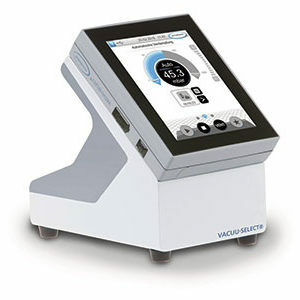 A combined digital and analog display provide both accurate results and quick trend indication. The measuring interval can be switched between 3x/sec., 1sec, or 1/3 seconds for increased battery life, or increased display stability with rapidly fluctuating pressures. The DVR 2pro is suitable for many general purpose lab applications with house vacuum, water-jet aspirators, or diaphragm vacuum pumps. 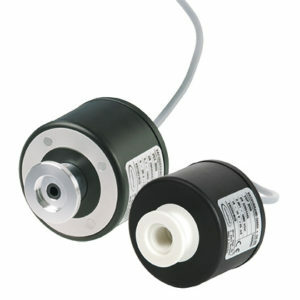 Manufactured without fragile springs or glass tubes; Corrosion-resistant transducers ensure rugged reliable operation. Results shown in millibar, torr or hectoPascal – you decide! Power supplied by a 9V alkaline battery, with an adjustable sleep timer to extend battery life. 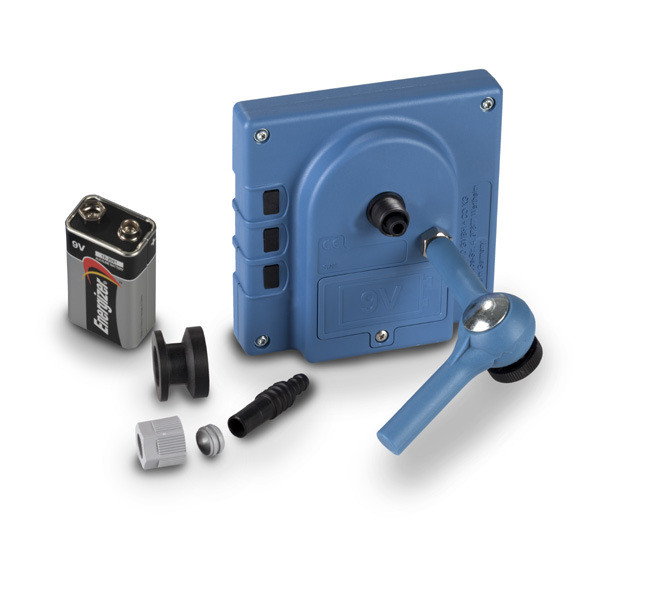 In general, our DVR2pro gauge works well with nearly all of our diaphragm pumps. However, for four stage pumps (MV series), like the MV2 NT, or MV10C NT, the DCP3000 + VSK3000 or VACUU-VIEW will be able to register the deeper vacuum provided by these pumps. 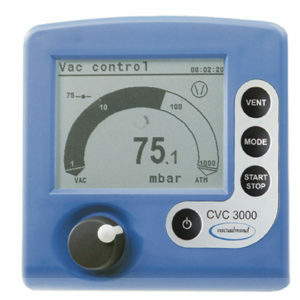 The DCP3000 + VSK3000 can also be chosen for the ability to mount the gauge head separately from the display or because it uses line current rather than battery power. The DCP3000 + VSP3000 or VACUU-VIEW extended are excellent choices for rotary vane pumps and roots pumps. ⚠ WARNING – This product can expose you to chemicals including Lead and Lead Compounds, which are known to the State of California to cause cancer and birth defects or other reproductive harm.